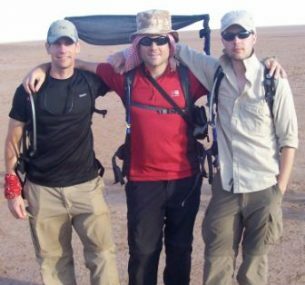 In October 2011, friends Matt, Alan and Mike trekked the Sahara Desert and raised over £13,000 for Children with Cancer UK. Our journey began at the airport where we met up with our fellow trekkers – an eclectic group from all corners of the UK, but all with the same shared sense of apprehension. We also met up with our team leader, Andy (a Gulf War veteran and ex-special forces, a man of few smiles, and someone you wouldn’t want to mess with! ), Jacquie the doctor (to be known simply as “The Doc” for the remainder of the trip), and Kathryn from Discover Adventure (the company running the whole show). On the first morning, Andy delivered the first of many daily briefings over breakfast. The sheer volume of kit stacked up brought home the scale of the operation ahead of us. Rucksacks, medical kit, and provisions formed a small mountain beside us. Everything had to be carried in some shape or form, nothing to be left behind. We set off to our starting point, where we met our camels and the cameleers who were to become such a big part of our immediate lives. It was now time to start walking and it was hot, very, very hot! There was clearly going to be no escaping the heat, and that thought was cemented by stumbling across the bones of a dead camel within the few minutes. We were told it would have just collapsed one day and simply wouldn’t have been able to get up again. Temperatures in the height of summer can exceed 50 degrees; we were lucky and had to endure a mere ‘upper 30’s’ on that first afternoon. 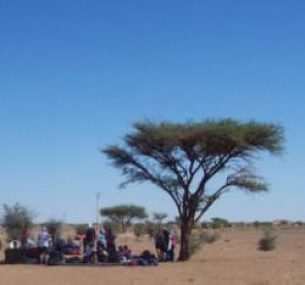 The group were in good spirits and we were being broken in gently – small dunes and a short three hour walk into first camp; piece of cake. That was until one of the team went down within the hour. Before long, the support vehicle arrived for her and she was taken off to camp. We weren’t expecting everyone to last the distance but not making the first afternoon was a wake-up call, little did we know that this was just the start of things to come. 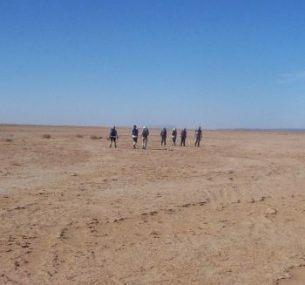 Arriving at our first camp, we were amazed at what we were confronted with. We weren’t sure exactly what to expect but it wasn’t this – four big tents to sleep in (or not as the case would be), a cooking tent, a big mess tent, and toilet tents, there was even a medical tent where our colleague was resting up. Our Berber support group, who travelled ahead of us each day to set all this up. They were remarkable people, working like Trojans and nothing was too much trouble for them – everything was done with a smile on their face. 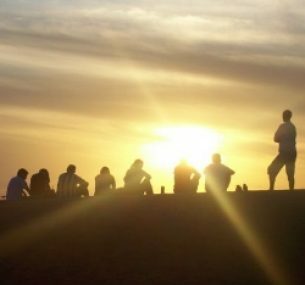 We quickly learned a big life lesson from them – enjoy each day as it comes, appreciate what you have, and don’t worry about what you don’t have. The Berbers are without doubt the most welcoming people you could ever wish to meet. Our regular evening/morning pattern took shape – arrive into camp, get out of our trek gear, get washed up by whatever means you can, be it a small bowl of water or a packet of wet wipes, sit and watch the sun set, rendezvous in the mess tent for food (once again, what the Berbers were able to provide from apparently nothing was amazing), and then an early night. The temperature dropped around 3am to the point that we would all be in our sleeping bags in base layers, jogging bottoms, hoodies, and woolly hats – such a vast contrast to the daytime. We would always wake just before dawn, watch the sun rise, pack our kit, get breakfast into us, and hit the metaphorical road once again. What followed were days of walking across sand dunes and Hamada’s (barren and rocky plateaus), walking west following a mountain range known as the ‘Jabel Bani’, grabbing the shade where we could (often this would be the one and only tree for what seemed like miles), and trying to win the mental battle by using the ‘one day at a time’ Berber philosophy. We saw virtually nobody, apart from the odd shepherd and, randomly one day, a guy on a pushbike! Where he had come from and where he was going was a mystery. He was clearly the Lance Armstrong of the Moroccan world as he must have been cycling for hours, even days! The heat was now becoming an issue, temperatures ranging from mid 30s to low 40s, and all of a sudden The Doc was called into action. The lady from the first day had to be taken back to Marrakech and a sickness bug developed within the group. The penultimate day arrived, and with it the longest and hardest walk and a climb up the largest sand dune in the area – the Chagaga, standing at 300ft. Here is where Matt made what can only be described as a large schoolboy error. The entire journey we had been given strict instructions to stay with or behind Lahcen, our Berber guide, but on this occasion we were told that we could scale the Chagaga at our own pace. Matt decided he was going to be Bear Grylls and get to the top first! He did it, but would regret it later… At the top, the view over what can only be described as ‘a lot more of the same’ was epic. 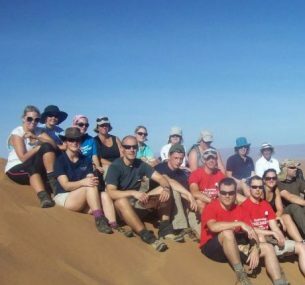 With the sheer scale of the Sahara stretched before us, this was the time to pull on our various charity T-shirts, take pictures, then sit down to contemplate what we had achieved and why we were there – a very emotional moment for many of the team. As the day continued, it was clear many people were struggling and people were being sick through dehydration and heat exhaustion. At this point it was Matt’s turn to get sick; with a temperature and The Doc administering drugs and injections it wasn’t looking good for the final day. The question being was it a sickness bug or just pure heat exhaustion? Thankfully it was the latter, and after a decent sleep, a Lazarus-style recovery, and massive regret about scaling the Chagaga at top speed, we had a full ‘Ten Days’ contingent for the final day. Unfortunately the same could not be said for the entire team. What started as 24 people setting out on the first day, had a third less setting out on the final day. The last day was another tough one, the Ikiri Salt Pan. A huge expanse of ‘nothing’, no plants, no trees, no shade! It was simply a case of putting one foot in front of the other and getting to the finish. Then came the point that we had been waiting for, the point that had seemed light years away when we first put pen to paper. After almost two years of planning, preparing, and fundraising, Andy stopped us all and said “guys, you are now at the 99.9 kilometre mark, you have 100 metres to go”. We all joined in a line and crossed the finish together, our colleagues who hadn’t been able to walk were there to see us home. What followed were lots of hugs and slaps on the back, the reality of what we had undertaken had not yet set in, it still hasn’t! All that was left was the question of how we were going to get out of the Sahara. The finish line was still in the middle of nowhere. As dawn broke the following day, our question of how we were to get home was answered – a cattle truck! A three hour trip across the desert in the back of an open vehicle in the midst of a sandstorm seemed an apt way to leave our desert home. After 20+ months of planning, fundraising and training, we can’t quite believe it is all over! We are so proud of our achievements and have experienced something that we will never forget. We also formed a great group of friends during our time, and in that environment it’s amazing how quickly people begin to gel and work as a team, that is refreshing in itself. The great emotion for us as a team, was knowing that anytime things got tough, we were able to stop and think about why we were there, the amount of support people had given us and the good we were doing for a great cause. We are so grateful for all the help we have received over the past two years. We had a target of £7,500 and to end up raising over £13,000 was amazing! If you’re inspired to take up your own charity challenge, join our team and help children with cancer!